Though the U.S. troop presence in Afghanistan is winding down, agencies still have $16 billion in the pipeline that will be spent on infrastructure and local military capabilities for years to come, a watchdog warned. Hence agencies such as the State Department and the U.S. Agency for International Development had better get used to continuing audits and loud publicity from any waste and fraud, John Sopko, special inspector general for Afghanistan Reconstruction, told an audience at Georgetown University Friday. The $104 billion already spent to bolster the war-torn nation’s government, economy, health and education sectors, and legal system represents “more money than we’ve spent on reconstruction for any one country in our nation’s entire history,” he said. As a longtime Washington player on Capitol Hill and in the legal community, Sopko frequently peppers his speeches with self-references and tutorials on the law’s charge that inspectors general function independently. “One of the things that has surprised me the most since I took this job is just how few people at USAID, in our Foreign Service and in the military were aware of SIGAR and more importantly the critical role of an independent inspector general as explained in the 1978 IG Act,” he said. Sopko noted that some agency employees expected him to allow them to edit his report headlines and approve his press releases. His team’s dozens of audits and letters to commanders and U.S. diplomats, SIGAR, he said, have saved billions—their audit of the Defense Department’s basing plans for the Afghan National Security Forces saved nearly a half a billion dollars for identifying “duplication and unnecessary expenditures,” he said. 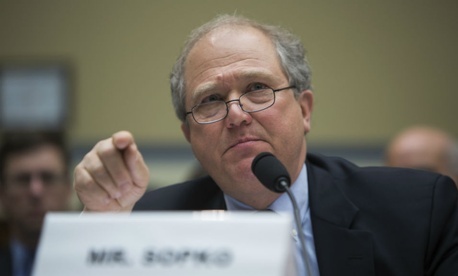 And yet Sopko’s auditing agency differs from other IGs in that it is temporary, not attached to a single agency, free to tackle issues from any agency involved in Afghanistan and is able to focus on multi-jurisdictional programs, he said. The prognosis for rebuilding Afghanistan, Sopko said, is bleak unless that nation and its American allies get a handle on sustainability, corruption and narcotics trafficking. “The sheer size of the U.S. government’s reconstruction effort has placed both a financial and operational burden on the Afghan economy and its government that it simply cannot manage by itself,” he said, pointing to an Afghan government’s revenue of $2 billion annually and a stated budget need of $7.6 billion. The United States has spent nearly $7.6 billion to combat the opium industry, but “by every conceivable metric, we’ve failed,” he added.